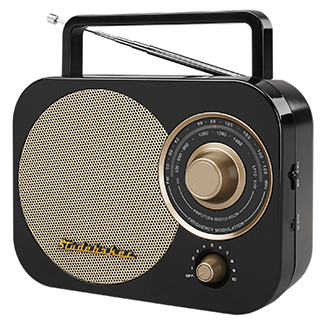 The Studebaker SB2000 AM/FM radio is an retro portable radio with classic styling, and easy to use features. The large analog tuning knob simplifies adjusting to your favorite station and the speaker delivers excellent sound with clear and static-free audio. Play music from other devices like your tablet, iPod®, MP3 player or other digital audio players using the built-in auxiliary input jack. The compact, durable design features a carrying handle and telescopic antenna. The SB2000 operates on 120V AC or on 4 x "C" batteries (not included), and makes the radio perfect for taking with you anywhere you go.